Click to call allows a user to click a phone number on your website or landing page and automatically dial the phone number on their mobile device, tablet, or desktop (if the right app is enabled, such as Skype). It isn’t a new web feature by any means, but if you aren’t using it yet, or aren’t using it to its full ability, then we highly advise getting it set up as it will not only benefit your customers, but your business as well. This added functionality not only makes it easy for website visitors to complete, but can be tracked to get greater insight into who is calling your business, from what source, on what day, and in what location. Harnessing that additional user data on call conversions can illustrate trends in audience behavior and how users contact your business. From there, the insights can be applied to your advertising or web design strategy to help you amplify the added value of phone calls. Applying tel: around the phone number on your webpage makes it a link that when clicked, dials the number you have specified. This makes it easy and user-friendly for people visiting your site to contact you to make an appointment, ask a question, or simply contact your business for more information. Don’t stop at setting up the clicking functionality. Don’t you want to know if your website visitors are actually using that now clickable call link? Go the extra mile and set up goal tracking for calls via one (or all) of the methods below – you will be amazed at what you discover from the data. One of the most common ways to track phone call clicks on your website is through Google Analytics (GA). As with anything setup via GA, tracking phone call clicks will give you more insight and metrics around your audience’s behavior – all of which you can learn from and apply to your website or advertising. To set up call tracking in GA, you will need to set up an event. An event fires when an interaction occurs on your web page beyond a page load – whether it be on a clickable phone number, a social media “Follow” button, downloading a PDF, or really anything that can be clicked. Add the snippet of event code to each phone number; when the phone number is clicked, it will fire back to Google Analytics and report back on the user’s traffic channel (organic, paid search, email, social, etc. ), device, geography, and more. Take it a step further by setting up the event as a goal, allowing you to track and report on a deeper level and also use phone call clicks as a main key performance indicator (KPI). Extra Tip: Before you begin, review Google’s event best practices. Your event code naming conventions should have a certain system and process, to avoid issues or conflicts in the future. Additionally, if you have a variety of phone numbers rather than just one, I’d highly suggest labeling them independently of one another so you can track separately in GA.
I’d be remiss in giving you the ins and outs of call tracking without mentioning third party tools. There are many companies that offer call tracking services and which enable you to get even more data than perhaps Google Analytics. For example, many integrate with marketing automation or CRM systems, thus tracking a call throughout the entire buyer journey. If you are interested in more detailed analysis or tracking in that manner, do your research and determine if the benefit will outweigh the additional cost. Another great way to get additional data from your click to call functionality is to set up Google AdWords Phone Call conversions. Choose the type of call conversion you need (typically we use “Calls to a phone number on your website”), and depending on which you chose, set up the conversion appropriately. If you are going to track calls on your website or landing page via a click to call number, you must add the code given to you by AdWords. Set when a call is tracked as a conversion in AdWords – think any call over 30 seconds is valid, and anything under is not? Set up the conversion that way. More control than GA due to being able to set what qualifies as an actual conversion. Optimize AdWords campaigns for call conversions. Can only used for AdWords advertising. Interested in organic traffic call metrics? 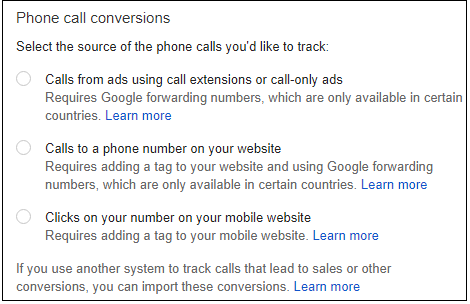 This will not work to track that traffic source or any other, so you will have to set up both AdWords call conversions and event tracking in GA or not get “Call Details” report and import GA call goal into AdWords. Be careful not to double-count conversions. 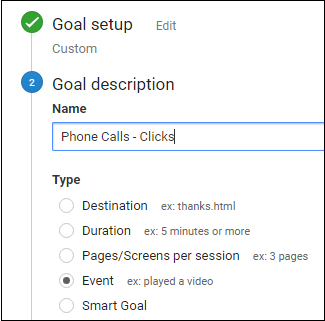 If you typically import goals from Analytics into AdWords, make sure you use only one call tracking method and not multiple. May need webmaster’s help to add tracking code to website. If code is stripped from the page or incorrect, it will not track call conversions correctly. We recently recommended a client set up click to call tracking on their website and advertising landing pages. The small change of applying tel: to all phone numbers and enabling event tracking via GA and AdWords resulted in a 725% increase in phone call conversions from paid search alone. Think of all the data associated with those calls, and the insight we gained from it! It was quickly evident that users visiting their website wanted to call the business, and setting up click to call made it easy for the user to do so rather than making them manually dial the number, all while enabling us to collect valuable call data. We were also able to adjust both our paid search and SEO strategies to further encourage calls to the business. Not quite convinced or want more strategy ideas? Learn how we helped increase online inquiries while lowering cost-per-conversion and increasing conversion rates via our SEO and paid search case study.